The Fat Tire Fest is coming October 17th to Castaic Lake! This photo from last year shows some of the people taking part in the Poker Ride. See the story about the 2010 Fat Tire Fest. CORBA has moved its member and contact management to a web-based system to give you online access to your account, membership renewal and e-News subscription choices, as well as event information and registration. Please access your account today by visiting http://membership.corbamtb.com - there is no obligation. If your membership is overdue, please consider renewing. For your convenience, you may still renew via PayPal or mail if you prefer. Important… first-time login – you will need to add/reset your password... For further details, read our blog entry on the new membership system. 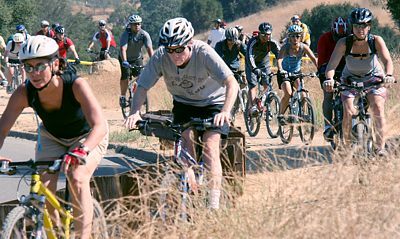 Rim of the Valley Corridor Public Meetings - Mountain Bikers Needed! The National Park Service is in the initial stages of conducting a special resource study of the area known as the “Rim of the Valley Corridor.” This is the area that generally includes the mountains encircling the San Fernando, La Crescenta, Santa Clarita, Simi and Conejo Valleys of Los Angeles and Ventura Counties in southern California. This is a study to determine how to manage this special resource for environmental and recreational purposes. It is vitally important that mountain bikers are represented at these public hearings to ensure that we are included in the planning process. There are some individuals and groups who would rather see mountain bikers banned from trails in the study areas. We want to ensure multi-use designations throughout the trail systems. For more background and information, visit our blog entry. The annual Fat Tire Fest will be held at Castaic Lake again this year, on Sunday, October 17th. The Fat Tire Fest is an all-day event geared for the entire family, featuring a huge raffle, activities for all levels and ages of riders, catered lunch and more. This year’s Festival aims to be our biggest ever. Activities range from the classic Poker Ride to a Hill Climb competition, Bike Limbo and Wheelie contests, Skills Clinic, Beginner and Advanced guided rides. NEW this year: special outdoor recreation clinics presented by REI! AND….. for the first time, a cyclo-cross race produced by Back on Track Productions. There will also be a special area for kids to test their skills, guided rides and demo bikes featuring some of the industry’s top mountain bikes. View our video of activities at last year's Fat Tire Fest! Preregistration is now open! Registers before October 10 and receive 10 additional raffle tickets. Choose between riding the Poker Ride or participating in a cross race. Visit http://corbamtb.com/FTF for details and register online at our new Membership and Event Portal. If you are interested in helping us organize and run this event, you can register online to volunteer! Stays tuned for more details, and see you at the Lake! We will be continuing the work we started in July to remove the overgrowth from the trail. This time we will start from the top, driving to the trailhead from the south end of Reseda Blvd, then riding or hiking in from there. You can ride there on your own, but let us know so we'll bring tools for you. CORBA will provide lunch afterwards. For more details and the meet time, visit our calendar entry for this event. Duekmejian Park was in the Station Fire burn zone. The trails in the park were heavily damaged from the heavy storms in the months after the fire. As a result the park has been closed since the fire. Right now the efforts are on the main park trails. Such as Dunsmore Canyon and Le Mesnager loop. Some of the trails are being rerouted and some are being repaired. For more details and the meet time, visit our calendar entry for this event. 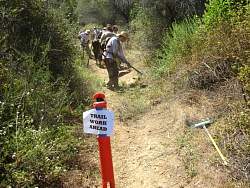 Join CORBA, SMMTC, COSCA and other volunteer groups to work on the Conejo Open Space trails. There will be a thank you lunch after the work. This is a great event with many volunteers. If you hike or ride the trails in Thousand Oaks, I hope you'll come out and help maintain these trails! No prior experience is necessary; they'll provide the tools and instructions on how to use them. 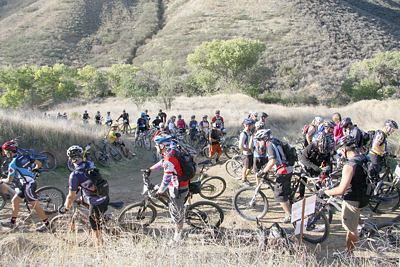 This annual Conejo Valley event draws a large crowd and as always helps to put some very sweet trails back into good shape. Be sure to stay afterwards for the free lunch and raffle. COSCA is trying to find the responsible party so they can repair this damage. Until that happens, be aware of this damage and ride safely. 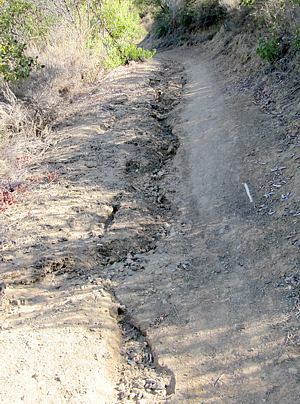 You can see a photo of the trailhead and water-induced rut in our blog entry. The Santa Monica Mountain National Recreation Area’s Paramount Ranch became a new location for CORBA’s Youth Adventures program rides. The first ever ride at this location took place on Saturday, August 7th, 2010. If you have ever had a chance to visit Paramount Ranch then you already know the beautiful landscape that surrounds this area. The Youth Adventures program was created to share this beauty with inner city children. And what is a better way than taking them bike riding through the rolling hills and share the rich history of this place with them? See more, including photos, at our blog entry. Saturday September 4th is the next skills clinic.